01B5SE Electro-hydraulic Lifting Crane is a heavy-duty, extremely versatile counterbalanced workshop crane (built-in ballast weights), with a 360° pivoting arm, suitable for lifting loads up to 500 kg. Fitted with traction battery and battery charger. Equipped with a 4-function hydraulic distributor that allows for adjustable and smooth jib lifting, lowering, extension and retraction. In case of fragile loads or awkward placements, lowering speed can be reduced through a knob. Lifting system is fitted with a security valve that prevents overloading and eliminates the risk of machine overturning in every position of its 360° rotation. 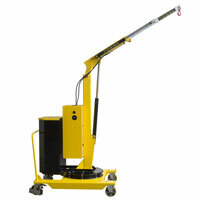 Optional jib extension increased the crane max reach to 1330 mm (at 160 kg capacity).